Books & Coffee, 26 rue St James. 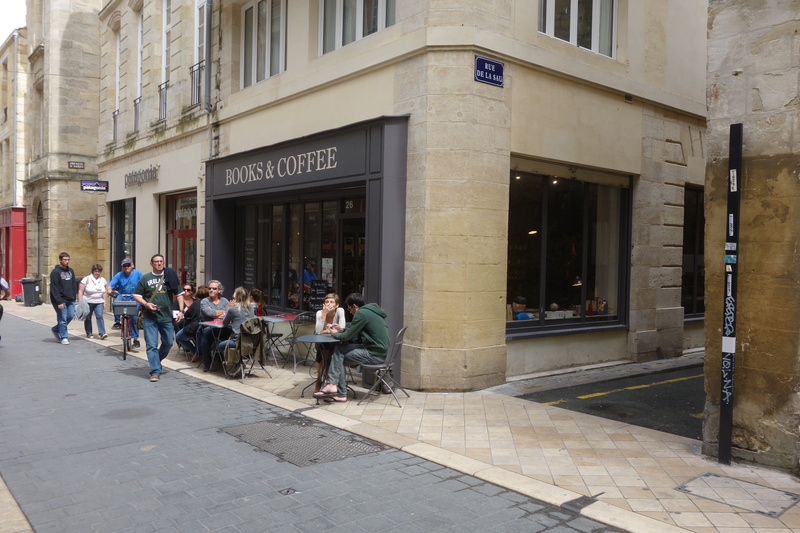 Four times last week, I packed up my laptop and took it to this café on rue St James. Three very gracious and attentive youngsters in the twenties work their butts off to offer coffee, tea, modest pastries, and a limited lunch menu for reasonable prices. I ordered tea most days, but I saw other customers order coffee in all forms, from an espresso to the bulbous glass beakers that look like they’re do equally well for cooking crack. The wood floors and metal shelving, the leather sofa and seats, and the tables of the interior gives the place a soothing library feel. A counter runs along a big side window and has books, children’s books, and toys to keep children occupied while their foot-weary parents recharge their batteries. I’ve had lunch there twice: a very good, custardy quiche and small salad the first time and a chicken-burger with bacon the second time. Unpretentious, tasty, and satisfying. 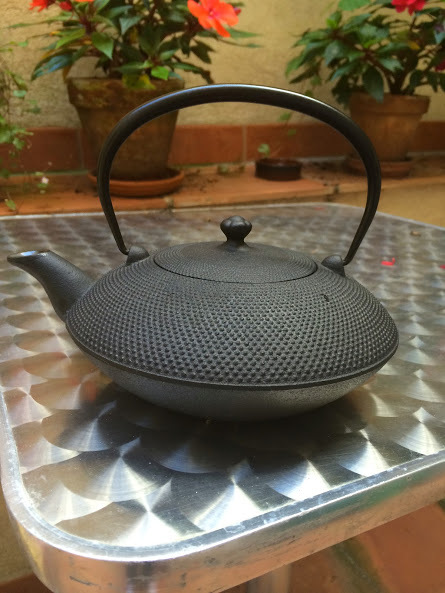 I’ve noticed that tea shops and cafés all over Bordeaux and in Biarritz carry two brands of ironware teapots made in Japan. The better quality brand, Oigen, does not seem to be widely available in the States. The design of these pots is beautifully simple. A cast iron Oigen teapot weighs around three pounds and is glazed on the interior. The ones I’ve seen here (and the one I bought at left) are priced around 98.50euros. On US sites, if you can find them, the pots run about $150. They eliminate the need for a tea cozy, because they retain the heat. Iwachu teapots are less expensive, noticeably lighter, and the varieties of designs less appealing — to my eye, anyway. Far more examples of this brand show up on Amazon. Somehow, I never imagined that a post about Bordeaux would reference cooking crack! Pleasantly surprised & amused.